My current PT student, Mitch Babcock, has brought some new ideas to the table to make our carries even more challenging as far as the stability demands go so thought I’d share those with you. Mitch Babcock SPT is a final year Doctor of Physical Therapy candidate from the University of Michigan — Flint. Mitch received his Bachelor’s Degree from Saginaw Valley State University in Mitch BabcockExercise Science and pursued his passion for movement and exercise to the graduate level. Mitch is certified in the Selective Functional Movement Assessment (SFMA) and the Functional Movement Screen (FMS), as well as a RockTape FMT Level II professional. He has also spent time with clinical rotations in a manual-based orthopedic clinic in mid-Michigan, a sports clinic in Charlotte, NC, and an outpatient neurological rehabilitation clinic in mid-Michigan. With a passion for full human optimization, Mitch is ready to help you get moving, get out of pain, and get back in the game. This entry was posted in Uncategorized and tagged back pain physical therapy traverse city, Elite Physical Therapy Traverse City, Kettlebell Training, Rotator Cuff Rehab, Scapular Retraction, shoulder physical therapy, sports physical therapy traverse city on July 21, 2016 by Joe Heiler. In part I of this series I discussed how traditional physical therapy exercises for the rotator cuff often miss the mark, and then in part II how dysfunction and a lack of motor control in other areas of the body can significantly affect the shoulder and cause pain. Be sure to read those, if you haven’t already, as this article will make much more sense. In part III I want to talk about another concept that has taken the therapy world by storm – Scapular Retraction. 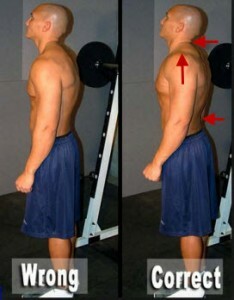 Try lifting your arm overhead maintaining your scapulae down and back like in the picture above. It isn’t going to happen. 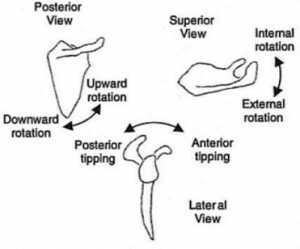 The scapulae are meant to upwardly rotate when going overhead to maintain the joint space and prevent impingement. Too much ‘down and back’ will actually create more downward rotation and greater impingement (see picture above in the upper left). Strike 1! 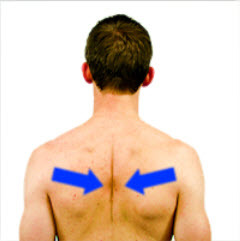 Scapular Reduction Test – the scapula is gently posteriorly tilted. This will often clear an impingement with shoulder elevation. Notice he is not pulling the scapula closer to the spine! 2) Too much scapular retraction with common exercises like rows and pull-downs can result in an anterior glide of the humeral head. Fancy term for the ‘ball’ of the shoulder sitting too far forward in the socket. This can also lead to greater impingement, and for someone with the very common condition of bicipital tendinosis can be quite painful. The top hand is palpating the borders of the scapula, while the bottom hand is palpating the front and back of the humeral head. Her humerus is seated anterior in the socket on both sides, but much more pronounced on the L shoulder. This is actually very common. I’ve seen quite a few patients with this type of shoulder positioning fail miserably with scapular retraction programs. You’re literally pulling the scapulae back and leaving the humeral head protruding even more to the front creating great impingement. Strike 2! 3) Remember in part II when I talked about regional interdependence? Anything you do to the scapula could create a reaction somewhere else. In the majority of cases the patient will overdo it, and you’ll end up with negative compensations elsewhere in the body. Check out the picture below. This is one of my all-time favorites, and I use this as a teaching tool with my students. I know they say the picture on the right is ‘correct’, but look at what he had to do to his neck and back to get there (the arrows are mine). He had to jack his neck and back into more extension, and over recruit his upper traps just to get there. Nothing like creating a neck and back problem while trying to fix the shoulder. It’s easy enough to do and I’ve seen many a therapist and trainer let this go. Strike 3! There is nothing wrong with a little scapular retraction to reposition the scapula on the thorax, but if some other issues are cleared up first this may just happen naturally. 1) Cervical mobility – the neck should move freely and without pain. I gave a great example of this in part II. There are a number of muscles running between the neck and shoulder girdle so any tension resulting in cervical restrictions can alter scapular position. 2) Thoracic mobility – the scapulae sit on the thorax so positioning and movement of the thoracic spine will definitely affect scapular positioning. Poor mobility creates an inability to adjust the posture to the activity, and poor scapular mechanics result. 3) Poor motor control – once mobility issues have been corrected (and it’s not just the cervical and thoracic spines), then scapular and spinal motor control often improve automatically. Scapular retraction exercises aim to strengthen the scapular muscles, but motor control basically means the muscles are positioning and moving the scapula the right way at the right time. See part 2 again for a more in-depth explanation. This is by no means an exhaustive list of possible solutions, but it’s a start. I plan on posting a couple videos next week showing how to perform pushing and pulling exercises correctly. I’m on my way to Chicago right now for a Graston Technique training so those will have to wait until I get back. Keep an eye out for those and part 4 – correcting scapular winging. This entry was posted in Uncategorized and tagged Elite Physical Therapy Traverse City, physical therapy traverse city, Scapular Retraction, shoulder physical therapy, shoulder rehab, sports physical therapy traverse city, sports therapy traverse city, traverse city sports therapy on May 31, 2013 by Joe Heiler.